REALITY has 21163 posts, 8066 threads, 1174 points, location: South, Middle. Middle South. In the South, In The Middle. The problem is, Trump doesn't have a strategy, let alone a comprehensive strategy. Going with his gut all the time means that other people, like the State Department, the Defense Department, all those other cabinet members are surprised and have absolutely nothing to say when Trump opens his mouth and declares something that only he has decided, usually without actually putting any thought into it. At least his attack on Syria was not unilateral, and involved Britain and France. This time. 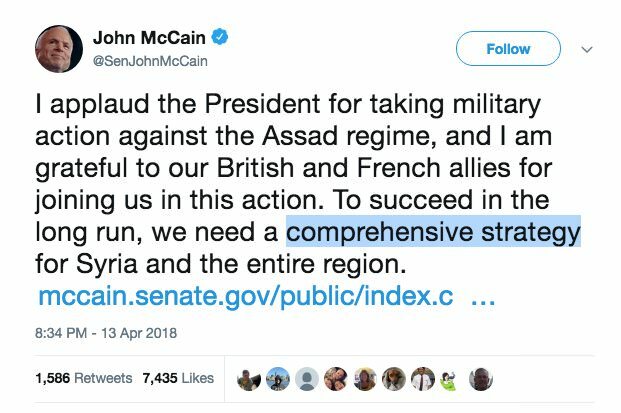 Well we have been bombing Syria for a while (years even) I don't think his predecessor had a strategy either. I am going to hope that the Pentagon will come up with a good strategy, as far as the current, if you douse your people in chemicals we will bomb you I guess is fair play. I wholeheartedly disagree with bombing them, but I have a feeling that both Syria and Russia were warned ahead of time to minimize human loss, also the targets were chemical facilities. The problem is, Trump doesn't have a strategy, let alone a comprehensive strategy. Neither did Obama, but you didn't have a problem then. However, there should be a game-plan including at the very least what our goal is (something sorely lacking in wars and military actions in the last half-century) so do I agree with the frustration you expressed. Though it's frustrating not knowing what Trump will do, we certainly can make a pretty good guess about what Hillary would do given her record... and that we certainly don't want. 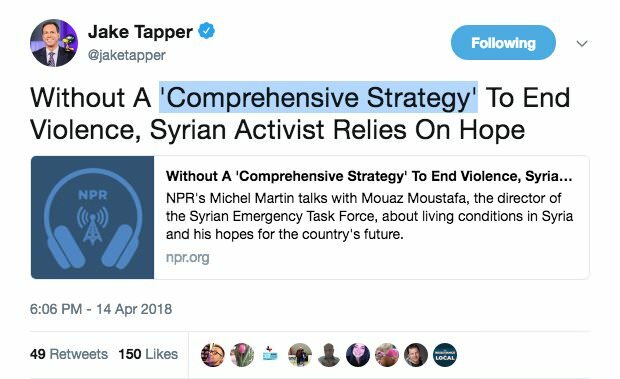 Not sure even Russia as a comprehensive strategy for Syria. define 'our'. You're democracy certainly isn't my republic. Nor Bush. Unless the Strategy is to keep the War Machine rolling out the $$$$. And yes...I had a problem with Obama continuing and expanding the madness. I know. You weren't the one I was quoting. Last war I thought was run appropriately in the Middle East was the Gulf War... and I was in high school and didn't know any better. Obama thought he needed Congress' OK to do what Trump did. And, he didn't get it. Trump doesn't. Time will tell who was correct and who wasn't. Although I think Trump right now has more important things that should be on his mind, and I'm not talking about Stormy Daniels or even Cohen at this point. They and Iran are propping Syria up right now. I was using the royal "you". I know you know. I'm saying that continuing it is/was/can be worse than starting it in the first place. I was not happy with Obama's continuance of Iraq and then the dive into Afghanistan/Syria. I knew he had a hard on for it before I voted but I had hoped it wouldn't come to be. I was in the Army for GW1. I didn't know any better at the time. While it was quick and had a project end it pretty much put us on the path we are on now. 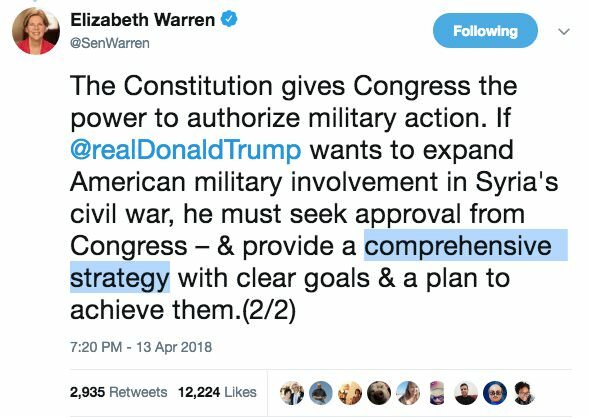 I think I heard the first use of "comprehensive strategy" by a Republican on Friday night, too.